At a special ceremony held today at Vaughan City Hall, Hospice Vaughan, along with Mayor Maurizio Bevilacqua, Honorary Chair of Hospice Vaughan’s Capital Campaign unveiled the Cortellucci Family as the naming donor of its new Centre of Excellence 10-bed Residential Hospice facility. 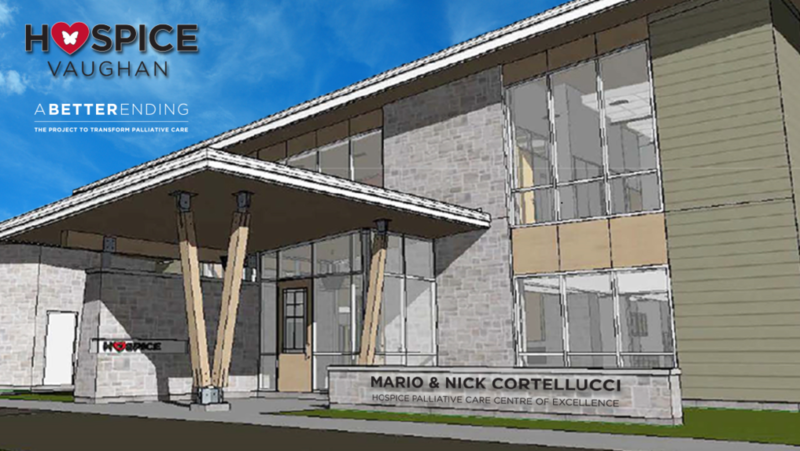 Mario and Nick Cortellucci have generously stepped forward with a $3 million donation towards the building of the new facility, which is currently under construction and expected to be open in 2019. The new Facility will be called Hospice Vaughan – The Mario & Nick Cortellucci Hospice Palliative Care Centre of Excellence. Local business leaders and philanthropists, Mario and Nick Cortellucci understand the need to bring compassionate care to individuals and families dealing with serious illness and grief and their support of Hospice Vaughan is a testament to their desire to give back to their community. This landmark donation is the largest in the history of Hospice Vaughan, bringing the total raised through the “Better Ending” Capital Campaign to $10 million, out of a total target of $12 million. Located just north of Rutherford Road on Islington Ave., Hospice Vaughan – The Mario & Nick Cortellucci Hospice Palliative Care Centre of Excellence will include a 10-bed residential hospice, family support and bereavement services, and visiting hospice services; and will serve as a community hub that will support research, education and knowledge translation of palliative care best practices. -Belinda Marchese, Executive Director, Hospice Vaughan. To review other capital donation opportunities or to discuss making a pledge contact Belinda Marchese at Hospice Vaughan, at 905-850-6266 x205.